This is a great time of year to hit a Farmer's Market as we creep into summer and all of the fruits of the season start showing their glorious colors. This past Sunday we decided to go to the Montrose market for the first time, and were pleasantly surprised at all of the produce and food offerings it presented. Racks of bbq rotisserie chicken sat alongside piles of bing cherries (SO SWEET!) and thick masses of kale while kids took turns taking rides on the miniature ponies. Almost immediately, I spotted the large mound of fresh apricots on one table and started grabbing. Although I'm not nuts about eating the fruit on its own, I love making desserts with them. Apricot jam is another favorite. Anyway, since they have such a short season, I had to get some before the window closed for another year. When I got home, I checked around and found this simple recipe which was perfect since I had a sheet of puff pastry in the freezer and bags of almonds in the pantry. I veered from the recipe slightly and used both pistachios and almonds in the sugar/nut mixture, and used regular granulated sugar instead of confectioner's since I didn't have any. I loved that the recipe made the fruit the star and didn't have a lot of filler. The galette was a cinch to put together- blitz some nuts and sugar in the Cuisinart and sprinkle on the puff pastry, place sliced fruit on top of sugar mixture, brush some egg wash around the rim, sprinkle the top with additional sugar and bake. Seriously- you could use any stone fruit in this and it'd be fantastic. In fact, I have over a hundred plums on my tree that will be making an appearance in another version of this when they're ripe. I brushed the cooled tart with some melted apricot jam to give it a nice shine, and it was done. I think a scoop of some good, vanilla gelato would make it even better! If you haven't made it out to a Farmer's Market lately, check out all of the mouth-watering choices that are available this time of year. To find a market near you, just check out this site. So May Sweeps on the television is almost over, and what a week its been. Not only do I love television, but I have to watch a lot of it for my job (whether I like the show or not) but who can complain. As my boss always says "What other job requires you to watch television?!?!" He's right- it's not like I have to risk life and limb catching crab in the Bering Sea or nothin' (Deadliest Catch is possibly the best show on television and explains why crab costs so dang much!). In addition to the American Idol finale (eh, it would have been more interesting had Blake won...it was a so-so season but that performance with Doug E. Fresh was awesome), Heroes ended with a bang (literally) and Dancing With The Stars closed out with Apolo Anton Ono (shout out to the Hapas everywhere!) crowned the winner. But really- who cares about any of this when LOST just blew it all out of the water with last night's season finale?!?!?! I had to remind myself to breathe during the entire two hours. One of the editors I worked with put it best when he said "The last five minutes of LOST last night was as significant as when Darth Vader tells Luke, "I'm Your Father" in terms of major twists in pop culture history." Now before you Star Wars maniacs start writing me hate email, remember that I'm simply quoting my co-worker. Not really being a Start Wars maniac myself, I can't really compare but I can tell you- it was awesome! Anyway, back to LOST later. Here's a soba dinner we had recently. Zaru soba- cold, buckwheat noodles dipped in a bonito broth mixture, wasabi and green onions. A summer-time favorite! Soramame (fava beans) boiled, peeled and tossed with some yuzu pepper. They sell bags of frozen fava beans at Mitsuwa, and although they aren't as good as fresh, you don't have to take them out of the pods so it's great for a quick snack or sidedish. 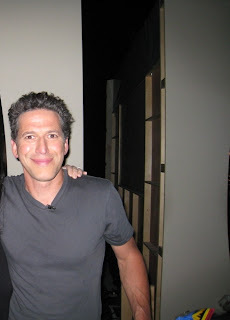 Speaking of LOST- we were lucky enough to have Michael (who's been gone FOREVER!) 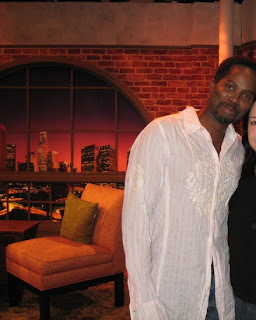 aka Harold Perrineau visit us on set the other day. 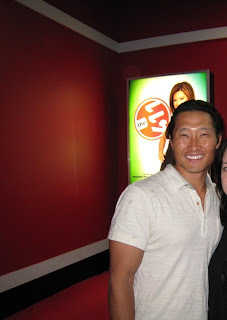 He brought along Daniel Dae Kim (Jin) so we were extra thrilled!!! Me and "Michael" with me cut out. We also did a food segment, and Bob Blumer, aka The Surreal Gourmet, was kind enough to come and show us how to whip up the most charming dishes for any party. As a food blogger, I was thrilled to have him and the food was delicious. So I guess this isn't much of a food post..more like a blubbering fan post. Sometimes variety is the spice of life, no? I had meant to blog about the rest of the dishes I made for a family dinner the day after I posted about the main course, but I just plain forgot. I don't have much time for a proper post today, so I'll share what we ate in addition to the lasagna that evening. As Ina Garten often recommends, I went to the Italian deli and bought my appetizers instead of trying to make five things by myself. I picked up some prosciutto di Parma, sopressata, bocconcini , sun dried tomatoes, bread sticks and a tub of seasoned, roasted bell peppers and simply arranged them to create an antipasto platter. I did spear the bocconcini with the sun dried tomatoes and a basil leaf but short of that, I didn't do much and it was fantastic. For dessert I made Mario Batali's Meyer Lemon Semiffredo with a bluberry sauce the night before. It was light, lemony and delicious. Last night, I was watching a Japanese movie, Shimotsuma Monogatari (Kamakaze Girls is the English title and I highly recommend you rent it now! ), on AZNTV (The Network for Asian America- yes, it exists and yes, I watch it) and I saw one of those dumb infomercials that literally stopped me in my tracks. I mean, we've all seen that ridiculous plastic cylindrical container that you toss pasta and hot water in, then presto! You have perfectly cooked pasta every time! Um, yeah......more like stuck-together-slimy-on-the-outside-but-teeth-shatteringly-hard-on-the-inside glob. I mean, you know how hard it is to boil water and then have to put the pasta in a pot. I mean, who has the time to for that??? Most of the products featured in these ads are ridiculous, but the one I saw topped them all, at least in my world. Even J thought it was so funny- we sat on the sofa and couldn't stop laughing. It's a takoyaki pan- used to make the little savory, puffy balls filled with octopus, ginger and topped with sauce and mayo otherwise known as takoyaki. It's a fixture on the Osaka street food scene (yeah, there's a scene) and a not-uncommon-kitchen-item in the home of many Japanese. Pancake puffs??? You've GOT to be kidding me! And on the Asian Network? Oi- the whole thing was so ludicrous. 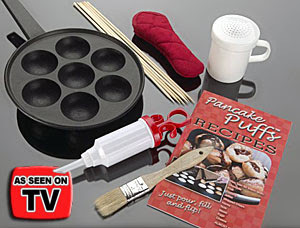 It says "Now you can make pancake puffs just like your grandma used to! Just use your favorite pancake or cake mix and pour it in to make easy-to-eat pancake puffs!" Er.....excuse me? The "pancake puffs" that MY grandma made would have likely been filled with chopped up OCTOPUS! The silliness continued with talk about how you could make a dozen different things with the Pancake Puff Pan. "Not only can you make the perfect sweets, but you can create pizza puffs, taco puffs, pepper puffs or cheese puffs - perfect for your next party!!!" "But wait, there's more! If you call within the next FIVE minutes, we'll upgrade your order to the Chef's Choice set which includes a filling injector and a dozen flipping sticks!" Flipping sticks? They look exactly like the bamboo skewers that come in a pack of one hundred for $0.38. I wonder what moron (or genius?) was in Japan, saw the takoyaki pan and thought "I'll call this Pancake Puffs and Flipping Sticks!" I miss many things about Japan, but the thing I long for most is the IZAKAYA. An izakaya is a Japanese pub that also serves food, but it is not the same as a drinking establishment here that does the same. Most izakayas in Japan are open late (some until 4:00 AM! ), have a variety of small dishes which cover the spectrum from sashimi to kari kari cheezu (crispy fried wontons filled with cheese). When you walk in, you hear the familiar call of "irashaimase," take your shoes off, toss them in a locker and hunker down with your friends for a few hours to talk, drink and nosh. There are small, hole-in-the-wall izakayas and there are huge, chain-type places with photos of every single thing (drinks too!) on the colorful menus. I miss them all, and have longed to find an izakaya here that lives up to even the mediocre ones that I'd frequent in Japan. Unfortunately, I have found nothing close and my first (and probably last!) visit to Haru Ulala in Little Tokyo last week just discouraged me even further on my fruitless search. I must admit, my search has not taken me very far. I'm sure there are places in Torrance that may grant one the true izakaya experience, but who wants to have a bunch of drinks and then face the daunting task of driving all the way home? (No one should, drinking and driving is bad bad bad!). Well, maybe I should designate a driver and search a bit out of my 15 mile radius zone, because when J and I found ourselves in Santa Monica last week for an evening appointment, we found what is definitely the closest thing to a true izakaya that I've found so far in Los Angeles. We had actually planned to go to the Newsroom (now called Interim Cafe) but when our eyes fell upon Musha, we couldn't resist walking in. I knew of Musha- we'd been to the Torrance branch a long time ago and although we did enjoy it, it hadn't blown our socks off- but we just never make it out to Santa Monica for dinner so we had never been. When I heard the calls of "irashaimase!" I started to get a good feeling. The vibe inside reminded of the izakayas I used to go to back in Japan, and upon a visit to the ladies room I discovered a zashiki - a room where you sit on the floor instead of chairs and usually made with tatami floors, although this one had wood ones- which would be perfect for a private party of six or so. Inside the bathroom hung Japanese kanji characters brushed-stroked by one of the staff, along with a sign that said "Don't take these- if you want one, I will write one for you!" Are people really that tacky as to steal art off bathroom walls? Anyway, on to the food. My friends that frequent the Torrance Musha are always raving about their Musha Fried Chicken (MFC) so we ordered one of those, along with some scallop shumai, salmon sashimi, tofu salad and the aburi saba. J had iced green tea while I sipped on my sauvignon blanc (I know- I should have gotten sake but I wasn't in the mood for it) and we waited for the parade of food to begin. The tofu salad came first- nice, beautifully soft scoops of fresh tofu atop mixed greens and capped with a dollop of good sesame dressing. Yum. The "shumai" were delicious but totally different than any shumai I'd had before. Instead of being wrapped in wonton skins, each billowy shumai seemed to be made of some sort of steamed egg white/fish cake mix and contained a scallop in the middle. They were all coated with thin slices of cooked egg yolk and topped with a bit of caviar. They were delicious! The famous MFC didn't disappoint- the tender chicken is first marinated for one day before being coated and lightly fried, which is what I LOVE about Japanese fried chicken- it is flavorful to the core. My mom's is better but their version was fantastic and came with a nice soy-based dipping sauce that also had grated daikon in it. What came next is definitely our new favorite dish- aburi saba. We both love shimesaba, but had never had it like this before. The waitress brought out a sliced fillet of seasoned mackeral, lit up a blowtorch then proceeded to torch the top of the mackeral until its oils dripped down the sides of the fish and the top was nicely charred. O M G. Yes- the fatty fish just melted in our mouths and begged to be washed down with a bit of ice cold sake, which I was now regretting not ordering! Not only does this dish create an opportunity for a nice show, it really benefits from the torching and I will have to try this one at home. (oh- J loved it so much that I came home from work two days later to find a blowtorch on my dining table- a gift - and not-so-subtle hint!- from J! Lastly we had the salmon sashimi which, as you can see by the glistening fat in this photo, was fresh and beautiful. Without a trace of fishiness (which can be a problem with oilier fish) the salmon sashimi was perfect and oozing with oil. Who needs dessert when you have salmon this good to cap off a spectacular meal?! We'll definitely be back to Musha again and again. I feel that our first Torrance Musha experience wasn't as good as the Santa Monica visit because we simply ordered the wrong things. I hope that a Little Tokyo Musha is in the works......Musha- please open in J Town!!! Little Tokyo NEEDS a Musha!!! It's too bad the two locations are so far from our house but we'll make the trek to have some more MFC and saba any day. Frequent readers (all two of you;) of Tuna Toast know that tuna is one of my favorite foods. I mean, this blog is called Tuna Toast for a reason, my friends. With so many exotic and interesting things to eat in the world, why is tuna one of my top five? I think it has to do with the fact that I ate it often growing up, and my parents made a simple can of tuna taste really darn good. Tuna sandwiches were a favorite, tuna casserole, tuna macaroni salad........it was never too loaded up with mayo and had bits of chopped red onions and other goodies. Now, when I taste tuna, it always takes me back a little, so part of my love for it is definitely sentimental. When we were in Nice a couple of summers ago, tuna was everywhere- on pizzas, in salads, and in the ubiquitous sandwich, the tuna Niçoise, or pan bagnat. It's basically a simple crusty roll filled with olive oil packed tuna, boiled eggs, olives, radishes, anchovies and other delights, depending on the maker. Basically, I was in tuna heaven, and I truly believe that the hot Mediterranean Sun and scent of the cool, blue water made the tuna taste even better than I'd ever had it. Since I had a can of olive oil-packed tuna in the pantry, I decided to whip up my version of a tuna Niçoise salad for dinner the other night. I just tossed some arugula and baby romaine in a dijon vinaigrette and piled it high with tuna, boiled eggs, roasted red peppers, green beans, baby tomatoes and these beautiful fingerling potatoes that I purchased at the farmer's market. I had to leave out the namesake ingredient- the Niçoise olives- because you know well by now my disdain for olives of any kind. I did sprinkle some capers over the top to get some of zing from the brine. The salad was enjoyed on our patio with a nice glass of sauvignon blanc- it's been pretty warm so it's nice to eat outdoors. The potatoes were so creamy and flavorful- I had tossed them in some of the vinaigrette while they were still warm so they'd soak up the dijon. It wasn't exactly like sitting on the beach in Nice, but it did take me back a little bit. As you know from reading this blog, J and I love to eat out, and do.......a lot. Too much, probably. Ok, defnitely! We have our favorites- Briganti and Bistro K in South Pasadena, Z Sushi in Alhambra, Sushi Gen in Downtown, Parkway Grill in Pasadena, Beaujolais in Eagle Rock, Mozza in Los Angeles.......we go to these places often because we know it's going to be good. As a food blogger, however, I should try new places more often and expand my horizons, but you know how it goes........there are few things more aggravating than spending good money on bad food and bad service. It's not like buying a sweater that doesn't look good when you get home- you can always return it. But seeing as you already consumed the meal, you can't really ask for your money back. And good food is so subjective........it may be crap to you and gourmet to someone else. There's also more of a chance that a new restaurant will be so-so as opposed to mind blowing.....there are just too many mediocre restaurants out there to avoid that. Well, that wasn't the case when our friend R suggested we try Fraiche this past weekend. We'd been meaning to make plans with him and his girlfriend for awhile, and, being fellow food maniacs, we knew we'd hit it off and we did. We rarely venture out to the Westside to eat but was excited at the prospect of trying a new place that I'd already heard some good buzz about. R was kind enough to bring several terrific wines, and we perused the menu while the waiter told us about the specials. Fraiche is actually divided up into two parts- the restaurant and the bar- with a separate menu from each. You cannot order bar items in the restaurant but both menus do share some items, like the raw oysters. Everything on the menu sounded delicious, and the four of us decided to share the Fruits De Mer Petit Plateau ($50) to start. Hm, I'm not sure what part of this platter was petit as a large, two-tiered behemoth of seafood was placed on our table. Oysters, clams, mussels, crab salad, shrimp, calamari salad and lobster sat on a bed of ice and came with aioli, cocktail sauce, mignonette, and horseradish . Every single thing was fresh, meaty, cool and absolutely delicious. Definitely worth the price and could be a nice meal for two. The chef (a friend of R's) then sent out an order of the mussels, which is on the bar menu only and usually prohibited from being ordered in the restaurant. I guess since we didn't technically order them, it was ok, and once I popped one in my mouth, I understood why the chef chose this dish to have us try. I'm sure you're thinking "Moules Frites? What's the big deal?" but these mussels were big, meaty and just so amazingly fresh and tasty- I can say they were the best mussels I'd ever had in my life. There- I said it. Each mussel was the size of Texas, or so it seemed, put full of the flavors of the sea. One of the favorites of the night for me. I asked R if he thought we should still order appetizers AND entrees, and he replied "Yes- I'm feeling indulgent tonight!" OK, I was convinced (doesn't take much, does it?). We each ordered an appetizer and an entree, sat back and waited for the feast to begin. J ordered the Smoked Eel w/ Arugula, Orange, Mint & Breakfast Radish ($11). It was lovely and refreshing, although I felt that the oranges slightly overpowered the subtle eel. Still, everything was fresh and lightly dressed- he liked it but would have liked a bit more eel. R got the Beef Tartare with Bacon Sabayon, Chives and Arugula ($13)- wow. We agreed it was the best beef tartare we'd ever had (I know I said that about the mussels but I'm serious about both). The beef was chopped into cubes so you really got the texture and flavor of the meat, while the bacon sabayon added a nice saltiness and smokiness which was very distinctive but didn't overpower. D ordered the Farro Salad with English Peas, Roasted Peppers, Herb Salad and Tuscan Pecorino ($9) - once again, fresh ingredients, great combination of flavors and a simple presentation made for a great first course. I'd definitely order this next time. I got the Tre Baccala- Whipped With Yukon Gold Potato, Crispy With Espelette Aioli and Crudo with Sea Beans and Tomato ($13). The crudo was my favorite as I'd never had salt cod served almost sashimi-style. It was pleasantly but not too salty, and the sweet cherry tomatoes were a nice compliment. I also enjoyed crispness of the baccala cake. R got the Kurobuta Pork Chop w/ Braised Baby Vegetables, Lemon, Violet Mustard ($23)- a big, honkin' pork chop which actually came on a bed of chive mashed potatoes in addition to the veggies. It was thick, tender and nicely smokey which I wasn't expecting but was really delicious. So many times at restaurants, pork is dry but it wasn't the case here. D had another thing I was eyeing- the Monkfish "Francaise" with Spinach, White Wine and Shallots ($22). The butter just added another layer of velvetiness over the tender fish and, again, made for a very lovely dish. I love the meatiness of monkfish and the entree was prepared simply to bring out the flavor of the fresh fish. Another winner. My Roasted Veal Cheek w/ Semolina, Romesco and Pickled Lipstick Peppers was as tender and melt-in-you-mouth as anything could be. See, I have a rule- if I see "cheeks" on a menu, I'm ordering it. Halibut cheeks, yellowtail cheeks, beef cheeks....you get the idea. The meat of the cheek is always SO tender and flavorful, so when I saw Veal Cheeks, it sealed the deal (although yes, I was distracted by that tortelli and the monkfish). I wasn't disappointed. The romesco was spread in a thin layer underneath of meat as not to overtake the wonderful flavor of the veal, and the puffy semolina cakes were subtle and delicious. Yet another winner. We couldn't leave without ordering dessert, and opted to share two. One was sort of goat cheese mousse with raspberry sauce and fresh raspberries which was divine. We also shared the cookie plate which was fine but nothing really stood out. I often order the cookie plate at a restaurant for the variety but have rarely had one that really impressed. I was pretty floored, however, by the warm madelines that the chef also sent out- wow. That was my kind of cookie plate. I'll put this out there in the interest of full disclosure. Yes, R is a friend of the chef and they have worked together in the past- this obviously was the reason we got the complimentary mussels and the madelines. However, every single dish was outstanding and I could see all of the dishes coming out of the kitchen looked of the same, stellar quality. J even said to me at one point, "Do you think everything is this good because R is friends with the chef?" I hardly believe that a busy kitchen would even have the time to make one set of dishes one way and all of the others with less effort, and you could see by the busy restaurant that the other patrons were enjoying their meals. As you can tell, I loved Fraiche and am looking forward to having many meals there. In a city where restaurants open with tons of hype, then disappear after a few months since that hype wasn't based on anything tangible, it's great to see a place that puts its food where its hype is. Los Angeles could use more Fraiches, that's for sure. The minute I heard that magical phrase, I knew it was something I had to eat. The description of ultra thin egg noodles surrounded by tomato sauce, mozzarella and parmesan and the crispy edges it all formed when baked in the oven were burned into my brain and I knew I'd have my day with the multi-layered dish soon. I decided to do the whole thing by hand- after all, I had purchased a pasta roller almost two years ago and only used it a few times. Every time I'd made homemade pasta before, I remember thinking how easy it was. I decided to make spinach noodles, so I simply blanched a couple of cups of baby spinach, rung it out and blended it with the eggs and olive oil before forming a dough with the flour. I used Mario Batali's egg noodle recipe from the Babbo cookbook, as well as his Basic Tomato Sauce. Let me tell you- that tomato sauce is a keeper. SUPER simple but so well balanced - I'll be making it forever. It's just olive oil, canned whole tomatoes, garlic, thyme, onions and carrots. Pure, simple and lovely. After I let the pasta dough rest for 30 minutes, I started the process of rolling it. Since the whole point of Thousand Layer Lasagna is to get the pasta as thin as possible, this took a lot of time. That one dough ball was enough to make maybe not a thousand sheets but it certainly felt like I had! I rolled each sheet until it became paper thin, put them in between sheets of moist paper towels and continued this for about 2 hours. Time consuming, yes, but very relaxing too. After about 40 minutes, I took out the hunkin' dish of lasagna, let it rest for another 10 minutes and took it out to the patio. J's parents were in town so my parents came and joined us for dinner. I cut everyone a nice, big slice and dug into a corner piece (hey- it was a lot of work so I had dibs on it!) for myself. It was light and rich at the same time- layers and layers of paper-thin pasta oozing with cheese and tomato sauce. I loved it, although I wished I'd baked it a bit longer to get more of a crust on the edges. Still, it was delicious. I'm glad that I took the time to make this. For one, I discovered the joy of Mario's basic tomato sauce. I also remembered how much I like making homemade pasta- and other than having to roll it on the thinnest setting- it's very easy and pasta dough is quite resilient. Of course the lasagna itself was reward enough! We enjoyed the lasagna with a multitude of other goodies of which I will post later!